A Kemp's Ridley sea turtle (Lepidochelys kempi), ashore, probably to lay eggs. 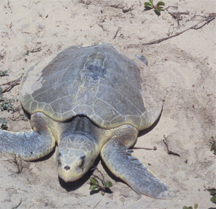 Kemp's Ridley sea turtles nest only in two areas of the shores of the Gulf of Mexico: at Padre Island National Seashore in Texas (a human engineered re-colonization), and in the Mexican state of Tamaulipas. As late as the 1940s these turtles were abundant, but hunting, habitat destruction and pollution reduced their numbers to about 1,000 by 1970. After listing as being critically endangered, they have begun to recover, and before the BP Oil Disaster, 8,000 adults were believed to be alive. What happens now is difficult to predict, but it is clear that the BP blowout will kill many Kemp's Ridleys. A return to the population levels of the 1970s is possible, as is total extinction. That human intervention has had both positive and negative effects on the prospects for the species illustrates the dynamics of self-canceling effort and disunity of purpose. For more on the Kemp's Ridley, see the Google video, "Saving the Kemp's Ridley," or read Leslie Kaufman's May 18, 2010, article in the New York Times, "Gulf Oil Again Imperils Sea Turtle." Photo courtesy U.S. Fish and Wildlife Service. Sometimes we work hard to achieve a goal, but measurable progress remains elusive. We sense movement, but we aren't making progress. It can happen in any organizational effort — projects, new product development, research, process improvement, organizational change — anything. And it can happen in Life — career advancement, weight loss, pursuing a dream. When this happens, what can we do? Here are seven popular ways to get nowhere and what can be done about them. The work itself isn't relevant to progress. Perhaps it's progress-neutral, or it might be progress in a direction unimportant right now (or ever). Review what you're doing. Exactly how does it move you towards the goal? The work underway might have both positive and negative effects that cancel each other out. An example: digging a hole but failing to throw the extracted dirt out of the hole. Are you doing anything that erodes the value of the overall effort? The method of measuring progress might be faulty. It registers no progress, but progress is actually real. How do you measure progress? Why do you believe that there's a connection between progress and whatever you measure? Even though each bit of effort moves you forward, you eventually revisit wherever you are. A form even more difficult to detect is like Brownian motion — you rarely (or never) revisit any one spot but the average position doesn't change. What's the evidence that the work underway actually produces steady advancement? cannot achieve it.infrastructure that you don't yet have in place. Consequently, the progress you do make is periodically erased. Bailing out a leaky rowboat without first addressing the leaks is a good example. Is there anything you could have done earlier that would have made what you're doing now any easier? Is it too late to go back and do it? Someone or some people are actively working against progress — political foes, disgruntled team members, or even yourself. Maybe you're aware of this, or perhaps some of it is outside your awareness, becoming visible only episodically. Have you talked with those involved in this conflict? If not, what would happen if you brought the issue into the open? Could it possibly be worse than what's happening now? Here the different elements of the group (or the different parts of your Self) are all working steadily and making good progress, but they do so in different directions with different goals in mind. In some situations, this disunity becomes clear only after a revealing incident. Unity of purpose requires investment. Announcements, memos, and orations alone cannot achieve it. Unity of purpose follows only from extensive mutual communication. Would you like to see your comments posted here? rbrenxjpWaVbwCqCLeqOnner@ChacgYPMbPBgLAGjPEQLoCanyon.comSend me your comments by email, or by Web form. I offer email and telephone coaching at both corporate and individual rates. Contact Rick for details at rbrenEqSbdrrDEPegAJwkner@ChacXukLKfYVQwUMSkdQoCanyon.com or (650) 787-6475, or toll-free in the continental US at (866) 378-5470.